Modi, who was in the city on Wednesday, visited city-based Poonawalla group's Serum Institute of India and showed interest in the cleanliness effort. Poonawalla is the group's owner and chief executive officer. His initiative is perhaps the first in the country wherein a private company has planned to spend so much on improving the waste management system of a city. The initiative resonates with Modi's Swachh Bharat Abhiyan (Clean India Mission) launched on Mahatma Gandhi's 145th birth anniversary on October 2, 2014. Poonawalla has put in Rs 100 crore to turn Pune into one of the cleanest cities in the country. Modi visited the vaccine major's premises en route to Lohegaon airport from Manjari in Pune where he inaugurated the international conference and exhibition on sugar value chain vision 2025 at Vasantdada Sugar Institute on Sunday. "The Prime Minister said the clean city initiative based on public-private partnership should be replicated in other cities across the country," Poonawalla told TOI. 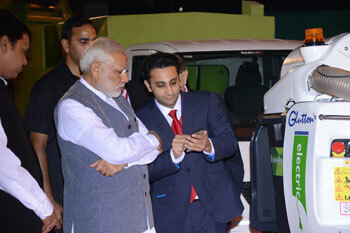 "The Prime Minister also took note of the various high-end technologies pressed into making Pune one of the cleanest cities in India that includes the Glutton vacuum litter picker and the Trilo small truck which uses the best technology to pick up and clear the waste from the streets for the first time in India," he added. Modi took stock of SII's low-cost life-saving vaccines for children. "He spoke passionately about poor children and stressed that more companies should come forward to produce low-cost vaccines so that more poor children can be saved from vaccine preventable diseases," Poonawalla said. Chief minister Devendra Fadnavis, former union agriculture minister Sharad Pawar, Union human resource minister Prakash Jawadekar and governor C Vidyasagar Rao were with Modi during his short visit where they were received by the SII's founder chairman Cyrus Poonawalla. The first phase covers roughly 30km of roads in Pune and the second phase will reach the whole city which is approximately 1,200km of roads. The programme will need the participation of individuals, corporates and segregation of waste at source in residential societies, hotels and office complexes. "It is only at that stage that we will truly be able to address our country's waste as it is done in Western countries," Poonawalla said. Meticulous planning has gone into designing of bins, logistics, truck movement and processing of waste.